I have a beautiful surprise for you. Do you remember I shown you 2 looks with the same bodysuit in the beginning at the week? If not here is the link for DAY LOOK and here is for EVENING LOOK. It was a corset that I used for two different looks – one for the evening and another one to wear during the day. It was a challenging project by Vedette that I was happy to join. Vedette creates a lingerie, corsets and bodysuits for special occasions and shape correction. Their bold project is to show that the lingerie can have a different usage. Could be wearing as an outwear garment for day and evening occasions too. Now, I am so happy to tell you that vedette offer 3 prizes for my readers as a Christmas gift. 1. Follow my blog via Gfc, Bloglovin and Facebook. The Giveaway ends on 10 of December and the winner will be choosen randomly. hey! kitti kovács called follow you on facebook. follow you under the name Judit Törtei bloglovinon. I follow under the name Judit Törtei gf. Mi piace molto. Un bacio cara. stavi benissimo con quel completo! ABSOLUTELY AMAZING. JUST IN LOVE. thank u for the visit on my blog! Esti foarte generoasa cu noi, iar acest giveaway este absolut irezistibil. Gasindu-l foarte interesant, intru si eu in concurs. thank you so much for your comment! you're doing such an amazing work with your blog my dear!! really amazing! :) loved both of your day and night look interpretations for this corset! gorgeous! :) one big kiss my darling! happy week! Very cute blog!.. I really like it!.. Do you want we follow each other?.. let me know!. 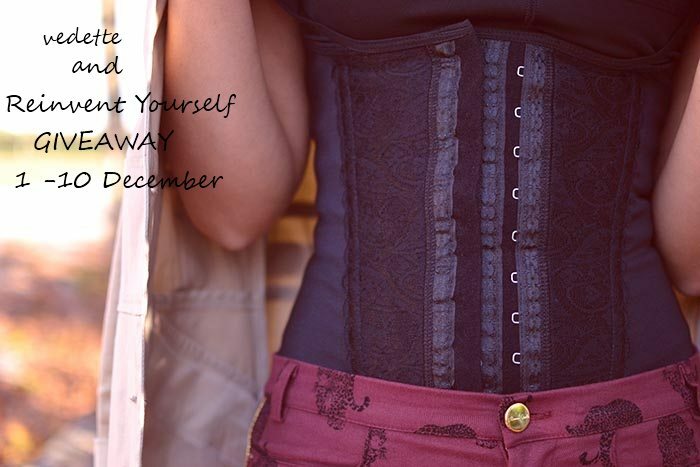 Happy December dear...the corset is gorgeous, good luck to all the entrants! Hola!!! I follow you in all the ways i can follow you!! !